With no permanent cure except for bone marrow transplant, which is available only to a minority of patients, and lifelong treatment in terms of regular blood transfusions for others, Thalassaemia is recognized as a significant health challenge to many in today’s context. Thalassaemia is the most commonly inherited disorder in Sri Lanka. Statistically, there are roughly about 60 new patients with Thalassaemia major also known as Transfusion Dependent Thalassaemia, being born every year in Sri Lanka. In a candid interview with Health Capsule, Senior Lecturer and Head of the Department of Pathology and Honorary Consultant Haematologist at the Faculty of Medicine, University of Colombo Dr. Lallindra Gooneratne and Lecturer at the Department of Paediatrics at the Faculty of Medicine, University of Colombo and Honorary Consultant Pediatrician at the Lady Ridgeway Hospital for Children, Colombo Dr. Ruwangi Dissanayake explained the nature of Thalassaemia in depth, while elucidating on the symptoms, diagnosis and treatment related to the disease. Thalassaemia is an inherited disorder of haemoglobin synthesis, which gives rise to anaemia in a patient. In the case of Thalassaemia, there are carriers of the disease who don’t have any symptoms or clinical effects. However, they carry the gene. Usually, patients who are symptomatic are those who have inherited the abnormal gene from their parents. Such patients could be either Homozygous or Compound Heterozygous. Homozygous refers to the same genetic disorder in both parents. Thus, the child will have a genetic disorder inherited from both parents. Comparatively, Compound Heterozygous refers to an instance where the patient is diagnosed with an abnormal gene from the mother and another abnormal gene from the father, but these two genetic defects are not the same kind of disorder, explains Dr. Lallindra Gooneratne. 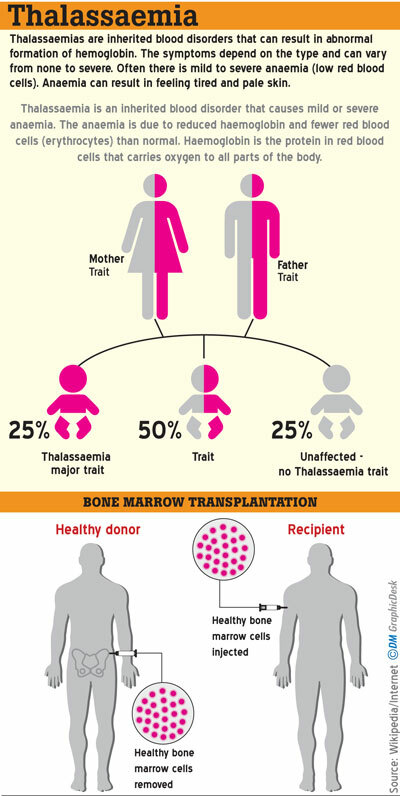 “There are about four common types of genetic defects found in Sri Lanka among the hundreds of genetic defects that could cause Thalassaemia. 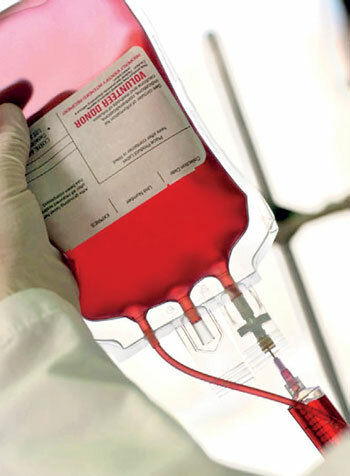 Roughly about 2,500-3,000 patients in Sri Lanka currently diagnosed with Transfusion Dependent Thalassaemia are in need of regular blood transfusions. It should also be noted that Haemoglobin has two components. One is ‘heme’ and the other is known as ‘globin’. Globin is a type of protein. These proteins are of two types; namely beta globins and alpha globins. The decrease in the number of beta globins is known as ‘Beta Thalassaemia’ and the decrease noticed in the alpha globins gives rise to ‘Alpha Thalassaemia,” he added. 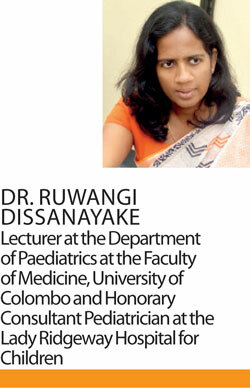 Speaking to Health Capsule, Dr. Ruwangi Dissanayake said the disease usually starts during infancy. The symptoms present themselves when the infant is about six-months-old. “They will show symptoms of lethargy, poor feeding and slow growth rate. We will also examine such babies for certain clinical features such as being pale, anaemic and distension of the abdomen; caused due to the enlargement of internal organs as part of anaemia. This is a defect of the synthesis of haemoglobin. We will conduct certain examinations to confirm the disease” she said. According to Dr. Dissanayake, the most common form of Thalassaemia dealt with in Sri Lanka is Beta Thalassaemia Major but other forms of Thalassaemia such as E Beta Thalassaemia and Thalassaemia Intermedia also exist. “Cases of Alpha Thalassaemia are also common in Sri Lanka but there aren’t many patients who are symptomatic of Alpha Thalassaemia. However, this completely depends on the genetic makeup of the patient. The bulk of our patients is Beta Thalassaemia Major and a certain percentage of E Beta Thalassaemia” Dr. Dissanayake said. Patients who are dependent on blood transfusions are diagnosed at a young age; mostly by the age of six months. When symptoms of paleness and inactivity are evident in the baby, parents bring their child for a medical checkup. 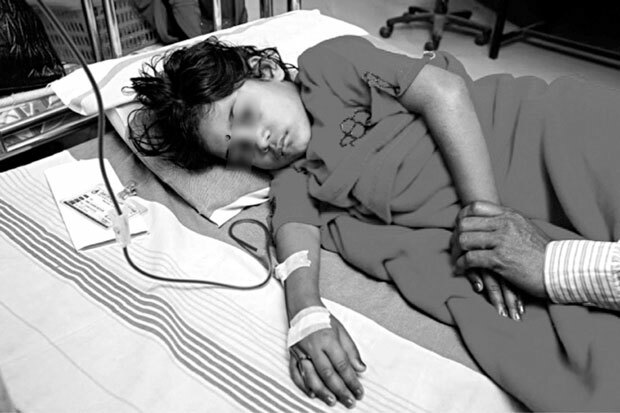 A blood count is conducted to check if the haemoglobin is low, and if the blood count indicates that the red blood cells are smaller than usual, this could lead the Paediatrician to a fair suspicion along with other clinical presentations, that the child might be diagnosed with Thalassaemia. 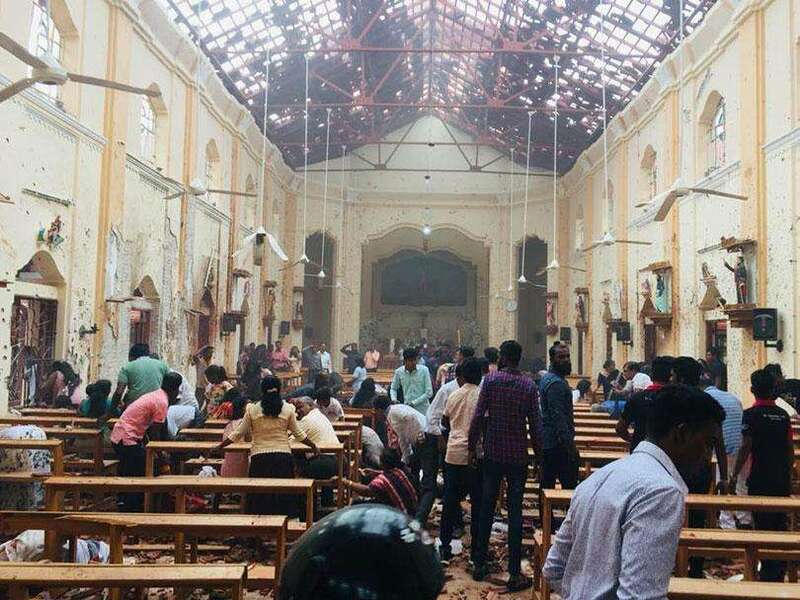 Dr. Gooneratne said if the Peadiatrician suspected that the patient had Thalassaemia, a blood test would also be conducted to indicate that the patient was diagnosed with the disease. These procedures will be ensued by a test named Haemoglobin HPLC (High Performance Liquid Chromatography). “Swelling of the spleen and liver are symptoms related to the diagnosis of Thalassaemia. Such swellings occur when red blood cells are not produced properly in the bone marrow due to a defect in the haemoglobin. Therefore, the amounts of blood cells which are required for the body are not produced adequately or effectively by the bone marrow. Thus, blood cells will be produced in the liver and the spleen. This is one reason why the liver and the spleen become enlarged. The liver and the spleen produce blood cells in the foetus but when the child is born and grows older, blood cells are produced in the bone marrow instead of being produced in the liver and spleen. When the blood cells are not adequately produced in the bone marrow, the liver and spleen takes over the job of producing blood cells again. This function gives rise to the enlargement of the liver and spleen” Dr. Gooneratne explained. “In the case of Thalassaemia, we are mainly dealing with the red blood cells or the haemoglobin. If a patient becomes very anaemic and has not been diagnosed early enough, this may give rise to severe health complications such as heart failure. Once the diagnosis is confirmed, we start treating the patient. Early treatment is also a means of preventing the rise of further health complications in the patient. Thalassaemia is a lifelong disease that requires treatment; especially in transfusion-dependent patients. 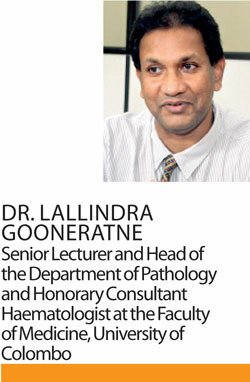 Such patients will have blood transfusions regularly” Dr. Dissanayake said. Iron overload is another health complication that arises due to regular blood transfusions. Growth in terms of height and puberty also can be affected as a result of the health complications arising due to Thalassaemia. A whole lot of hormonal issues such as diabetes, hypothyroidism and issues with calcium could also rise as other complications. Stating that only certain patients can be fully cured by bone marrow transplant, Dr. Gooneratne said that patients cannot be cured with medication. Almost every month since the day the patient turns six months old, blood transfusions will have to be given regularly for the patient. Accordingly, such patients will require blood transfusions throughout their entire life. “Giving blood transfusions is the only type of treatment available. However, when these patients are given blood transfusions, they tend to accumulate iron in them. One of the major problems why Thalassaemia patients become ill and die is because of the overload of iron accumulated in the body. Therefore, together with giving monthly blood transfusions, we should also give special medication to remove iron from the body” Dr. Gooneratne said. “Such patients will be on regular blood transfusions and after about the tenth transfusion, there will be a risk of iron accumulation in the body. Iron overload is something that is invariably going to happen. We expect the iron accumulation to happen between the tenth and twentieth blood transfusion. Therefore, patients will be tested to affirm iron accumulation in the body following the tenth transfusion. This is the treatment administered mainly to patients diagnosed with Beta Thalassaemia Major. Earlier, the medicine that was largely available was injections but now oral medicines are also available for treatment. The treatment options are usually discussed with the patient before starting on medication. Iron overload could affect a patient because the iron can get deposited in the organs. For example, most of the endocrine organs which are hormone stimulating organs such as the pancreas and the thyroid can be affected. This could also affect two main organs such as the heart and liver. If such complications arise in a patient, he or she may eventually die due to iron overload unless treated early” Dr. Dissanayake explained. Dr. Gooneratne said bone marrow transplant is at present the only curative option available to cure a patient completely. Other modes are currently on trial. For the first time in Sri Lanka, a bone marrow transplant was conducted in 2014. In 2014, the first transplant unit in Sri Lanka was established at the Asiri Central Hospital with patients who have been completely cured. However, he warned that the surgery does not work with every patient hundred percent successfully. Explaining how bone marrow transplantation is conducted, he said that very strong chemotherapy will have to be administered to destroy all the bone marrow of the patient since the defect is in the genes evident in the blood cells of the patient’s bone marrow. “After killing all the bone marrow, a donor’s (usually a sibling of the patient who is matched genetically) bone marrow is used for transplant by way of an infusion very similar to a blood transfusion. Once the donor’s bone marrow is deposited in the patient’s destroyed bone marrow, it starts growing anew and producing red blood cells that are genetically similar to the donor. In a successful bone marrow transplant, the blood group of the patient will convert to the blood group of the donor” he said. Screening tests are available in the country and everyone is encouraged to get themselves screened. The National Thalassaemia Prevention Programme spearheaded by the Ministry of Health is very effective in raising awareness on Thalassaemia. “The issue of medication against iron accumulation for free of charge. Except for the bone marrow transplant which is currently not available in the government sector, the blood transfusion and medication are given free to patients under the National Thalassaemia Prevention Programme. Since we are targeting prevention, screening is targeted mainly for healthy people, where they are encouraged to get a blood test done. If both partners are carriers, we discourage them to have children. This is the only prevention available. If two carriers get married there is a chance that they may have children with Thalassaemia Major. That is why we prevention is so important. If the screening tests reveal that one parent is a carrier while the other is not, then it indicates that a child they have in future might have a fifty percent chance of becoming a carrier too. The difference between a carrier and a patient is that a carrier carries but does not manifest the disease, whereas the disease is manifested in a patient” Dr. Gooneratne said. Awareness programmes are being conducted in all centres of the programme to promote prevention and better health education. Your feedback is very important to us. We can help you resolve your health concerns and problems. Tell us how we can improve with ideas, suggestions and comments. Your queries on the stories we have found for you are also welcome. Write to us at dmhealthcapsule@gmail.com. Let us help you achieve your health & fitness goals with Health Capsule.